Sheryl Crow is currently in London promoting her new album, "100 Miles From Memphis". 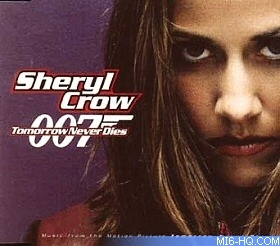 Back in 1997, she recorded the title theme for Pierce Brosnan's second outing as James Bond in "Tomorrow Never Dies". "Oh, Sean Connery", she says when asked about her favourite. "I love the early James Bonds â Goldfinger is great, Dr No, I love Dr No. I love the campness, the double entendres and sexual innuendos."